This has been my last contribution to the carnavalesques workshops with MACAQ association. The theme of 2009 was… Monsters! So we decided to build the most scary and magnificent coach ever! Like a ghosts-drawn vessel, covered with insect-monsters, running out from bewitched swamps! We worked during one month, with every people who wanted to take part. At the beginning, me and my collaborator Delphine Terlizzi had to build the metallic structure and the main wood parts. Then children, big ones, old ones… everybody could find a way to contribute. 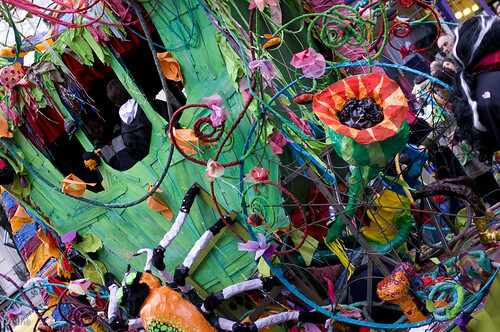 Creating a monstruous insect with papier-mâché, decorating the interior of the coach as a treasure with colored plastic beads, covering metallic structure with tinted fabrics, painting wood walls of the coach….AND of course, creating horrible costumes!